You know those games where you earn three points, but the game itself wasn’t anything to remember? That would be this match. Despite dominating the newly promoted SPAL and taking 20 shots, seven on target, Milan failed to score on the run of play. 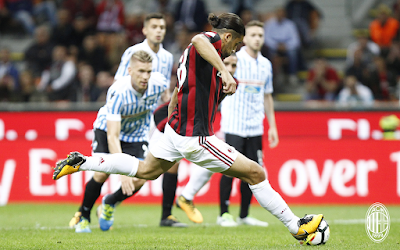 Capitalizing on two big errors from SPAL, Milan took all three points. They didn’t do anything particularly memorable, but they did enough. And that’s all that was needed. The one truly memorable point of the night was the 45,000 plus spectators at San Siro. On a Wednesday night. A shame they couldn’t have been more entertained, but they didn’t mind the win, either. Milan started off attacking, taking a number of shots in the first 25 minutes. Most notably, Abate had one of the first shots on goal in the 19th minute. Yes, you read that correctly. Abate. But the game changed when Gomis reached for the ball and grabbed Kalinic’ foot in the 25th minute, taking him down. No VAR needed, that was a penalty. So in the 26th minute, Rodriguez stepped up and converted the penalty to make it 1-0 Milan. Interestingly enough, Kessie gave Rodriguez the ball to take the penalty. Montella mentioned afterward that there are two designated penalty takers, but didn’t mention a hierarchy. 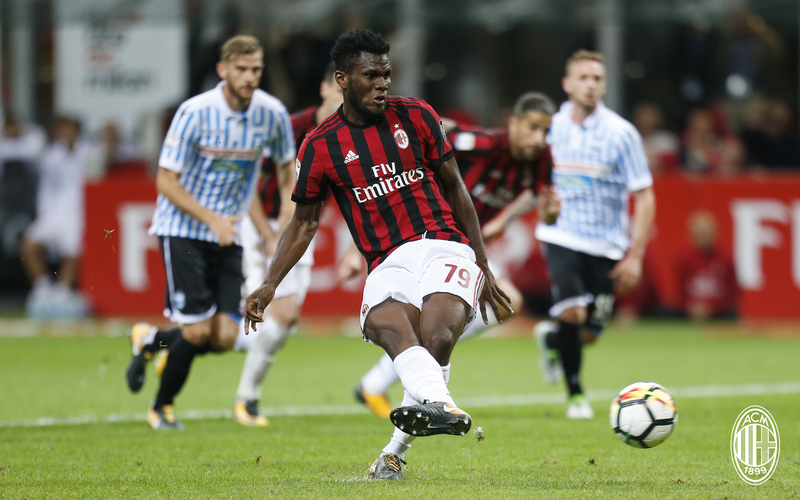 That didn’t matter in the end, though, as in the second half, Kessie himself, the other penalty taker, was taken down in the box. So in the 61st, he stepped up and coolly converted the other penalty. 2-0 Milan. Very fitting for him, he had an amazing performance with absolutely no signs of fatigue, despite playing the most minutes of any of our midfielders so far this season. Despite unleashing first Paloschi and then Borriello, our two exes, Semplici’s boys didn’t have enough to even get a shot on target, with only six shots taken. 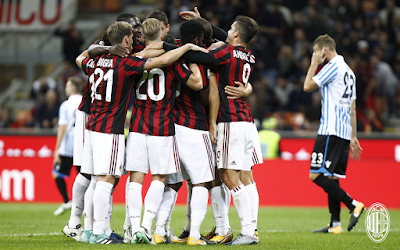 But a little frightening that Milan, having come out so dominant and attacking, seemed to retreat mentally in the second half. There were errors, but luckily none too egregious. Gigio came out of not only his box but the area and was playing chicken with a SPAL player in the 77th, yet somehow, it didn’t seem that threatening. And Romagnoli went all of 89 minutes before he got his requisite yellow. Seriously, though, he had a great game, absolutely atoned for his error on Sunday. Oh, and worth mentioning: Bonucci’s goal line clearance in the 50th. You know I love my goal line clearances from defenders. While I’m still not crazy about the 3-5-2, Montella does seem to be prioritizing the Serie A matches, and that is important. He lined up a very strong starting 11, albeit without the tragically fit Borini and sadly injured Montolivo. But it was a midweek match against a newly promoted side, and he put many of his best players out there, which I appreciate. Hopefully, playing together so much will help them gel, but more importantly, consistently pulling the wins regardless of the entertainment value will help to cement their mentality. For this match, though, taking advantage of two penalties was sufficient.